For high school student-athletes and coaches, the day of a game always adds extra touches of excitement and anticipation. 4:40 a.m.—The alarm clock sounds in Father Hollowell’s room in the rectory at St. Malachy Parish in Brownsburg, where he also serves as a sacramental minister. 5:30 a.m.—Father Hollowell arrives at St. Michael the Archangel Parish in Indianapolis, located next to Cardinal Ritter Jr./Sr. High School. 6:45 a.m.—Begins his daily workout in the high school’s training room. 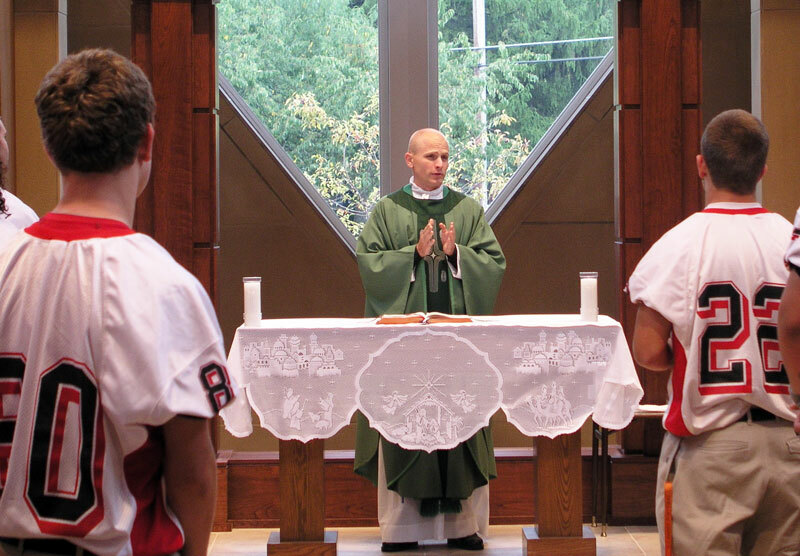 8 a.m.—He often shares a morning prayer with students through the high school’s public address system. 11 a.m.—Lunch time. On one recent Friday, his lunch consisted of two small bags of pretzels and a bottle of water. 11:30 a.m.-3 p.m.—In the classroom, teaching “Modern Catholic Social Ethics” to high school seniors. “It’s a Catholic understanding of justice, freedom and truth. For me, my journey to the priesthood was a lot of reading and studying. It was an intellectual journey. I want to pass along to the kids the things I’ve discovered along the way. 3:15 p.m.-4 p.m.—Celebrates pre-game Mass with the football players and coaches. 4:15 p.m.—More time spent grading papers and preparing lesson plans for his classes. 5:30 p.m.—Boards the bus with the players and other coaches to leave for the game. 7 p.m.—The opening kickoff. With his game face on, Father Hollowell spends the next two hours providing encouragement to the team, shouting tips to the players on the field, and giving individual instruction to wide receivers and defensive backs when they come off the field. 9:10 p.m.—He leads the team in a post-game prayer on the field. 10 p.m.—The team returns to the high school. Father Hollowell talks to individual players and then watches game film and/or gets something to eat with the other coaches. Midnight—Returns to the rectory at St. Malachy Parish, checks a few high school football scores on the computer, says his evening and night prayers, and heads to bed.